Now a day whatsapp is most popular social media port. people are searching for How to send images on whatsapp without loosing picture quality. Here the solution, for the search "How to send original size picture iPhone as well as Android". 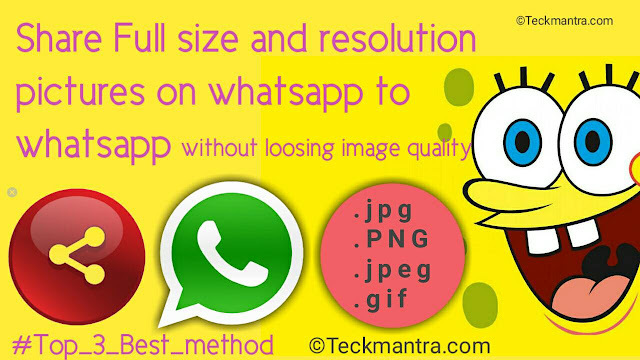 Here I'm going to explain the top best three method send picture on whatsapp high quality without loosing image size. Here the three method we also included how to send pictures without compression. why people are searching for Does whatsapp reduce image quality, it's obvious dude whatsapp use your phone as server and there a need of compression of medias for better performance. Here a Tip : You can also use whatsapp for your image compression by sending images on your own number. 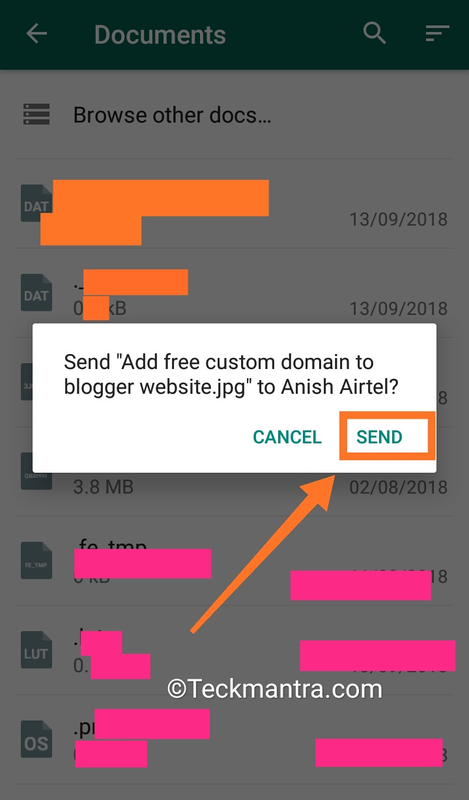 How we can share images at highest quality by whatsapp through IOS and Android including computer (whatsapp web) dude here the tips only for share the original quality of picture. The resolution, size and clearly will going to same as the originals. First i want to i want to Clear that, whatsapp use your device as storage of medias like own servers. All media (Images, video, txts, gif and other) are stored in your Device by whatsapp Apk for showing, sharing and forwarding the media. Here you are getting a important benefits of this compression that is saving of Internet data during sending and receiving media form whatsapp to whatsapp. Here a problem of Storage for the whatsapp developers and they have to decided, we need to be included a compression with media files. And whatsapp starts compressing the all media including videos and gif. Yes dude the whatsapp always try to compress video too. What will happen when i want to share my photos in same quality i.e without loosing image size and resolution. We also need the original photos (that was clicked by camera) for saving, sharing on other social media like face book and pinterest. Also the highest need when we want or do editing with images. If you are a graphic designer or know the image editing then i think you should definitely know what we face during editing of low size and resolution type images. So dear here the top three best solutions in whatsapp for such original sharing of images. 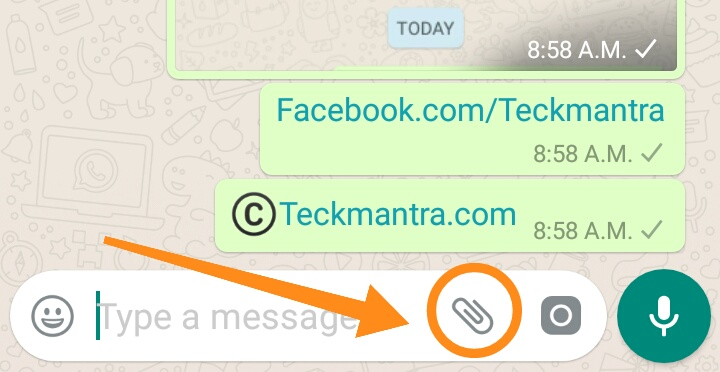 Step : 1 open Your whatsapp, select the contact where you want to send pictures and tap on Attachment button. Step : 2 click on documents button and choose your image that was to be send. Step : 3 After select the image click on send button. Now your image are sanded with same original quality. Make sure the document is enabled. Here documents is an app name i.e already installed with all Android device. 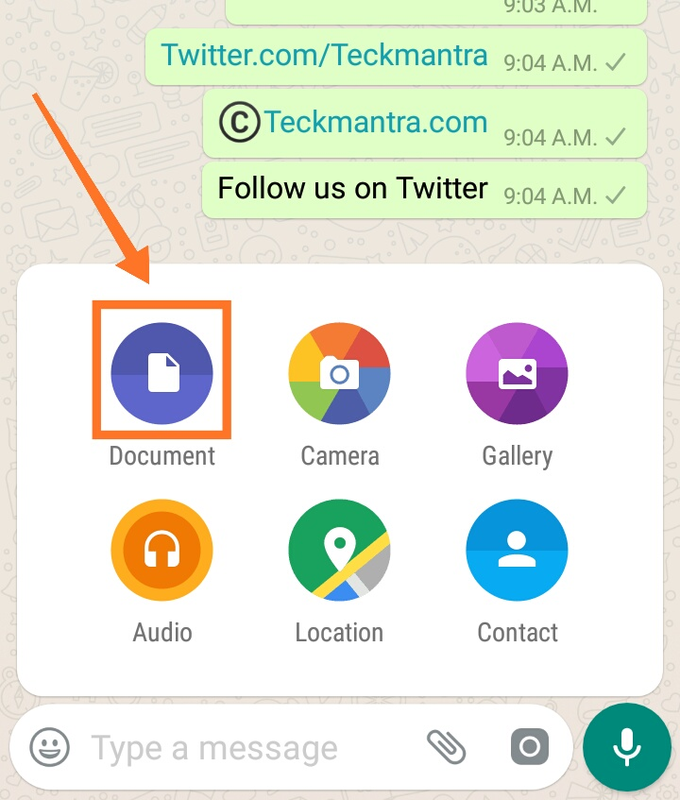 Tip : You can send any Type of file by documents attachments from whatsapp to whatsapp including extension .apk, .exe .pdf etc. Even without extension such as blank or editors raw documents or files. Need of any other applications : Yes, in some device. (Device have no option for compressing and extracting zip files on file manager. I'm such case to compress image files use RAR for Android and ios. Use 7zip for Windows. Direct receive and open : No, You need to extract the zip file first after receiving and downloading it. Make sure you have checked first in you default file manager, most of android phone have in build option for compression and extracting files. In such case no need to keep other application in your Device. We already have a best method (Method one) then why I'm writing here 2nd method? Answer is, in some case the 2nd method perform better than 1st method. Because you can compress hundreds of images and send all at once and receiver can receive all picture by downloading and extracting only one zip or rar file without loosing any of images quality. You can use this method after a function, party and marriage etc for sending and receiving the pictures in original quality. It also help to manage your Storage and separate location of your images. 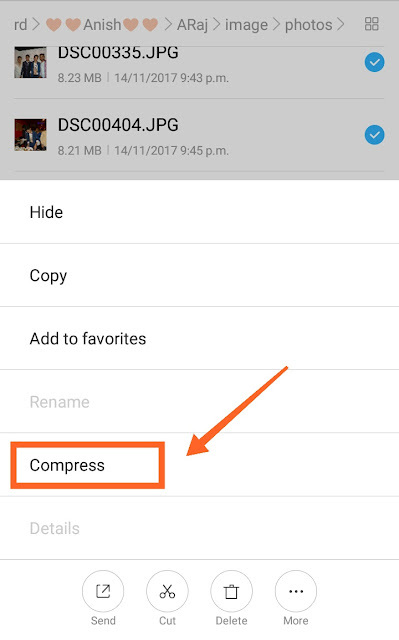 Step : 1 go in your file manager select image (one or more than one) and compress it. Step : 2 Now send the zip or compressed folder attaching with documents as per as method one. That's all for 2nd method. 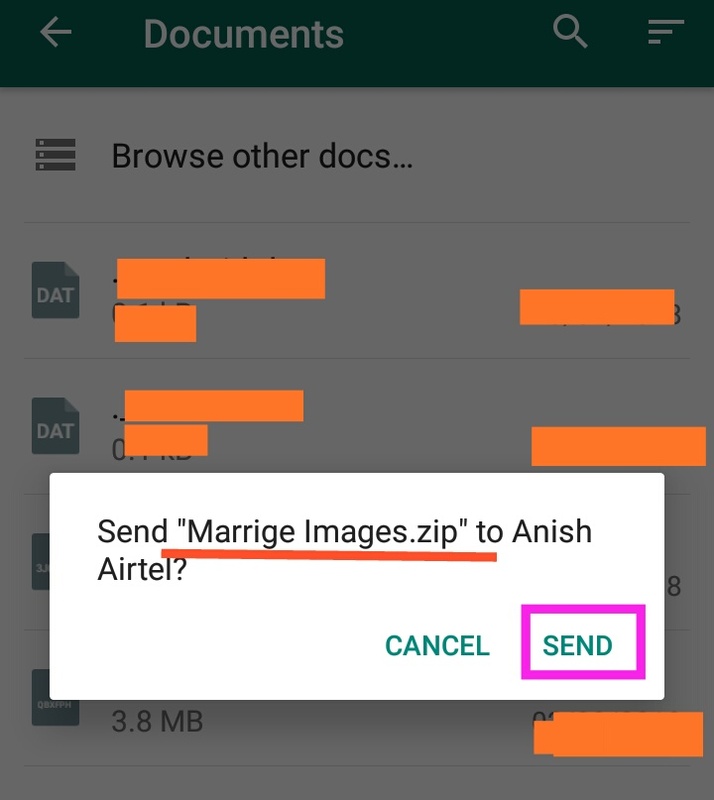 Tip : You can compress multiple things inside one zip folder as I'm sending here some images, videos and some audio from a marriage to a my whatsapp contact. 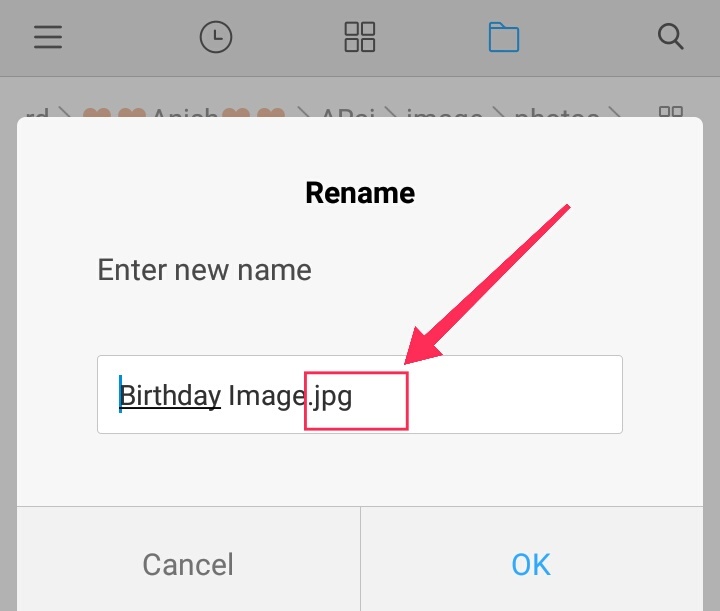 By changing or hiding the extension of images. Direct receive and open : No, You need to edit or fix the extensions first after receiving and downloading it. I don't know why I'm typing 3rd method after two best comparable method, but I'm sure here the third one is best in sensitive case of image sharing on whatsapp without loosing picture quality. Step : 1 simply you need to rename the image (Extension only). You can keep the name anything. Male change with extension. Main image Extensions are .jpg, .png, .jpeg etc. You can edit the extensions or remove the extension, A warning notification appears while changing the extension of any file. Mark OK and change it. Step : 2 Send it (Edited extension's image) attaching with documents as per as method one or two. Attention : (to receiver) you can't open the image after downloading, there a error message appears "No application available to open this file"
1. You can "open with" gallery or any image viewers. 2. Put the same file extension (Renaming of extension) that was before the sending. Last lines : That's all for image sharing whatsapp to whatsapp without loosing any pictures quality. You can use any of method as per as required. But this article may helpful for other whatsapp User such as your receiver, you can send this article by whatsapp click to Send on whatsapp. Or copy the link from your address bar. You also can Bookmark this page.